Cockfield is in West Suffolk, about 6 miles south of the market town of Bury St Edmunds, and close to historic Lavenham. It is a spread out village, geographically the second largest village in Suffolk. Cockfield’s 800 residents mainly live grouped around its eight greens. 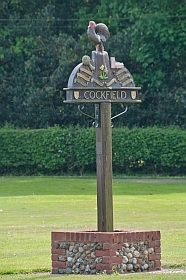 Cockfield was awarded the title of Suffolk Village of the Year in 2012, a title the whole village was very proud to receive and one it wears with pride. This is a booked meet as the site is limited and refreshments will be provided.